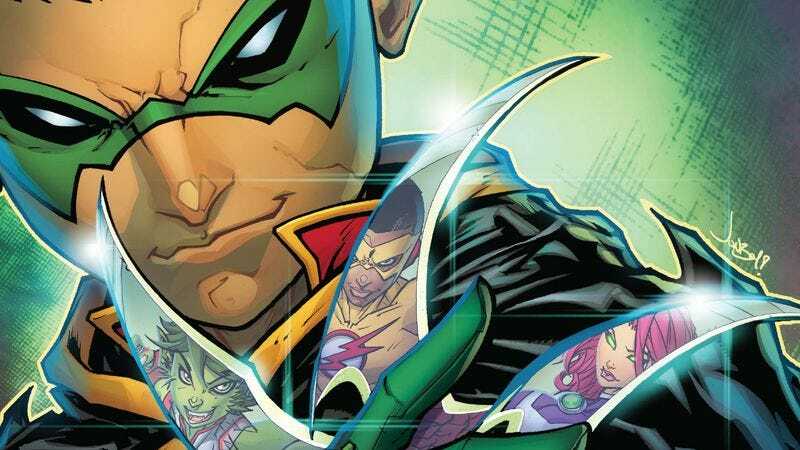 The Teen Titans have had a rough recent history at DC Comics, but Damian Wayne is coming to save the team from mediocre storytelling. Writer Benjamin Percy has done very strong work revitalizing Green Arrow for DC’s Rebirth, and he’s taking Teen Titans in a new direction with the help of artist Jonboy Meyers and colorist Jim Charalampidis, getting the team back together with some old favorites and fresh new faces. Damian is planning to use the team to take out his villainous grandfather Ra’s Al Ghul and his League of Assassins, and he assembles his new squad in the pages of next week’s Teen Titans: Rebirth. Knowing the threat the Teen Titans will be facing, Damian doesn’t take it easy during the recruitment process, as Beast Boy learns in these preview pages. Gar isn’t in the best place emotionally after the “death” of his old teammate Tim Drake (reader of Detective Comics know the truth about Tim’s demise), and he’s taking advantage of his uncle’s fortune to forget his troubles with nonstop partying in the Hollywood Hills. The bright, energetic artwork by Meyers and Charalampidis accentuates the thrill of this hedonistic lifestyle for Gar, and while there’s an undercurrent of darkness in the script, the visuals accentuate the fun of being a shapeshifting superhero. That fun is exactly what the Teen Titans need, and hopefully the creative team will find plenty of time for humor and joy as the team embarks on a new mission.